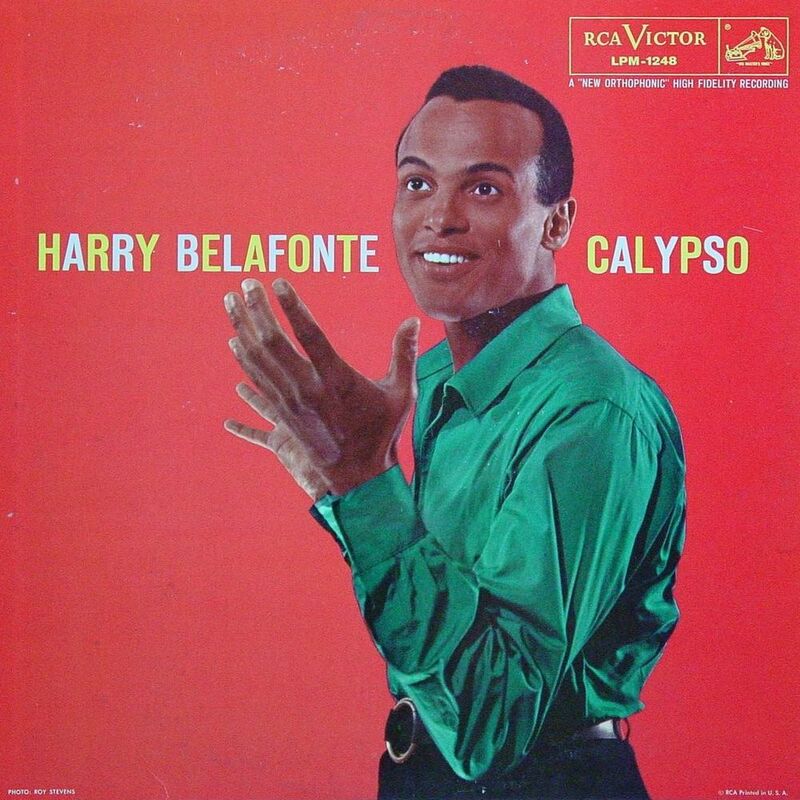 When HARRY BELAFONTE hit it big with such hits as Island In The Sun, Banana Boat Song, and especially his million selling album Calypso, he became RCA Victor’s best selling act. 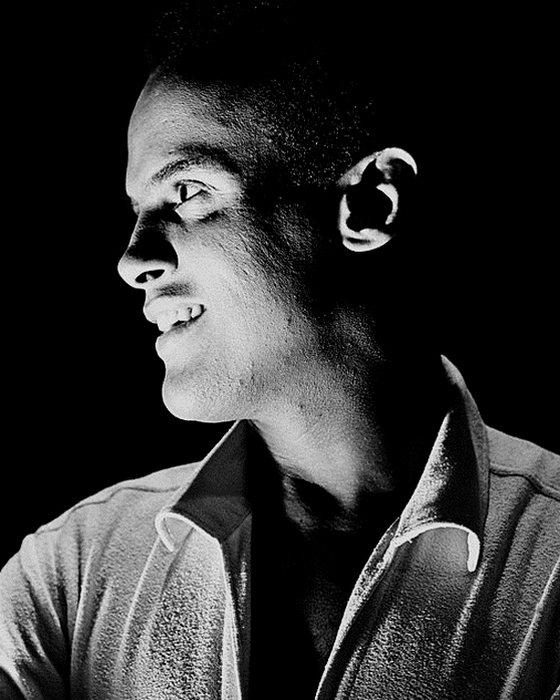 Harry Belafonte, born in 1927, was crowned CALYPSO KING. 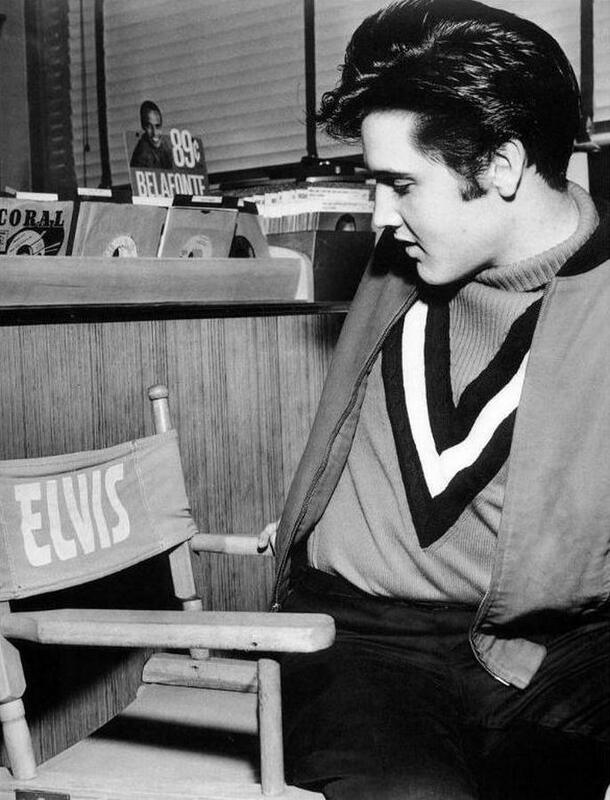 Around the time America went Calypso mad, another music genre quickly grew out of proportion: Rock ‘n’ Roll, and ELVIS PRESLEY, also under contract at RCA, became known as the KING OF ROCK ‘N’ ROLL. The media of course, were responsible for crowning both Elvis and Belafonte ‘Kings’ of their respective genres. 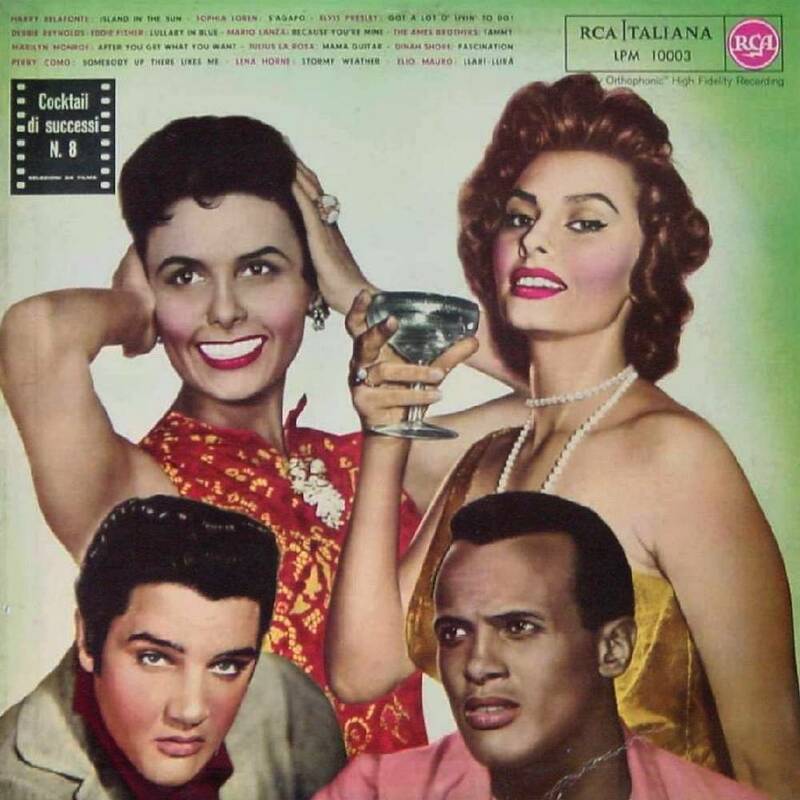 In this topic we’ll take a look at the impact of Harry Belafonte and his Calypso music on Elvis’ popularity during his breakthrough years of 1956 and 1957. For a year, or even less, the almighty media had hoped the Calypso Dance would wipe the floor with the nasty Rock ‘n’ Roll craze. Of course it didn’t. 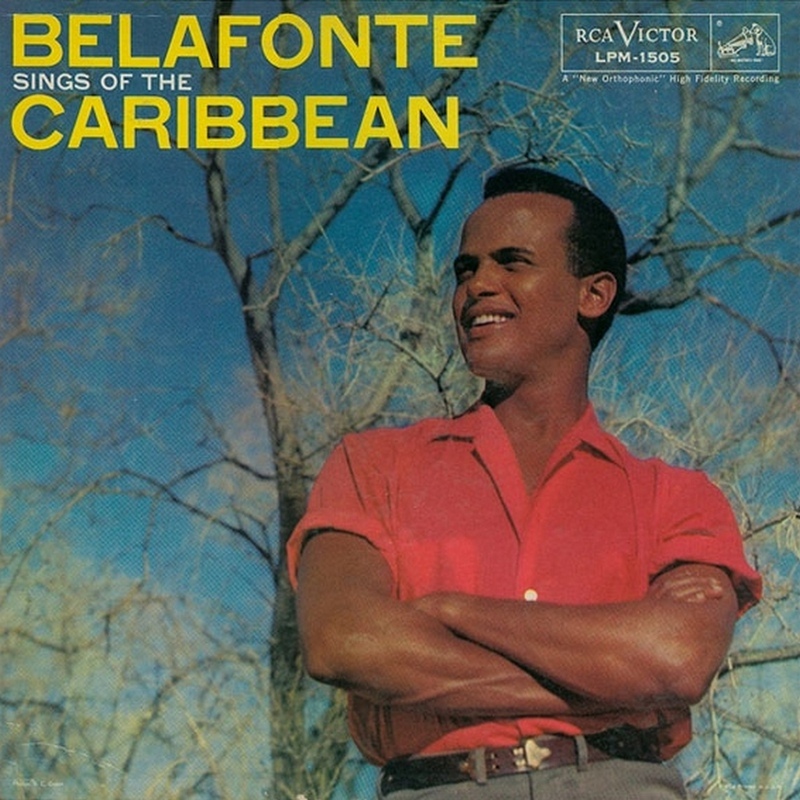 Belafonte was loved for the most part by adults while Hep Cats couldn’t be bothered with the Caribbean Calypso sounds favoured by their parents. 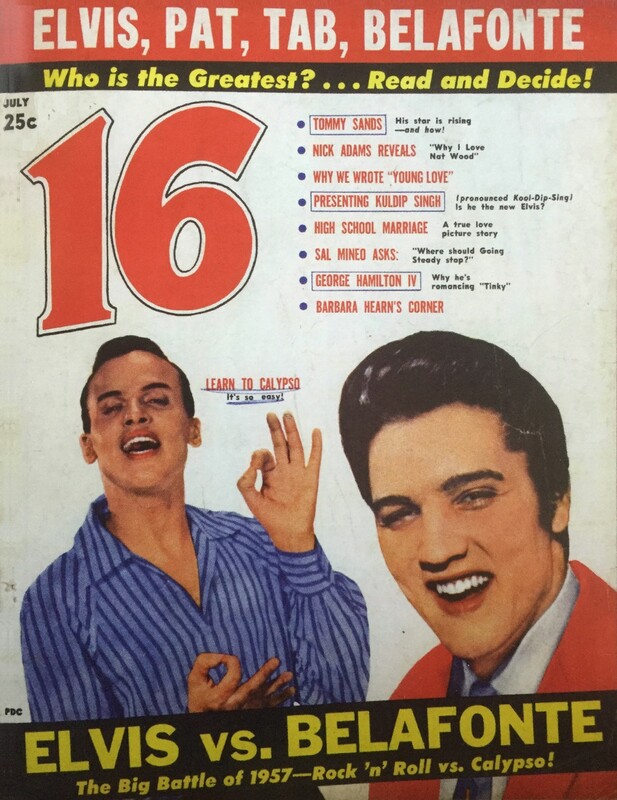 The magazine publication from the first half of 1957 simply titled 16, with both Elvis Presley and Harry Belafonte on the cover, is undoubtly one of the rarest Teen mags ever published. 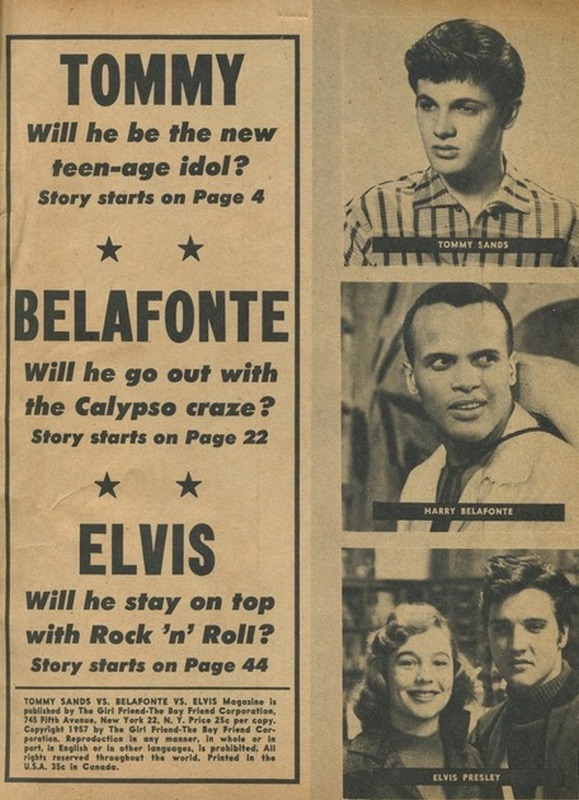 Some magazine editors smelled money and teamed the then very popular Belafonte up with Elvis in two of their Teen titles. Both of these magazines were published by the same house that had previously done ELVIS AND JIMMY and ELVIS SPEAKS in 1956. Combining Elvis and Belafonte turned out to be a big failure since Teen mags were bought mainly by young white girls and Harry Belafonte didn’t exactly fit their taste. Many copies of both titles went back unsold to the publishing company in New York, and because sales were so poor back then, very few copies of both titles have survived into this day and age. 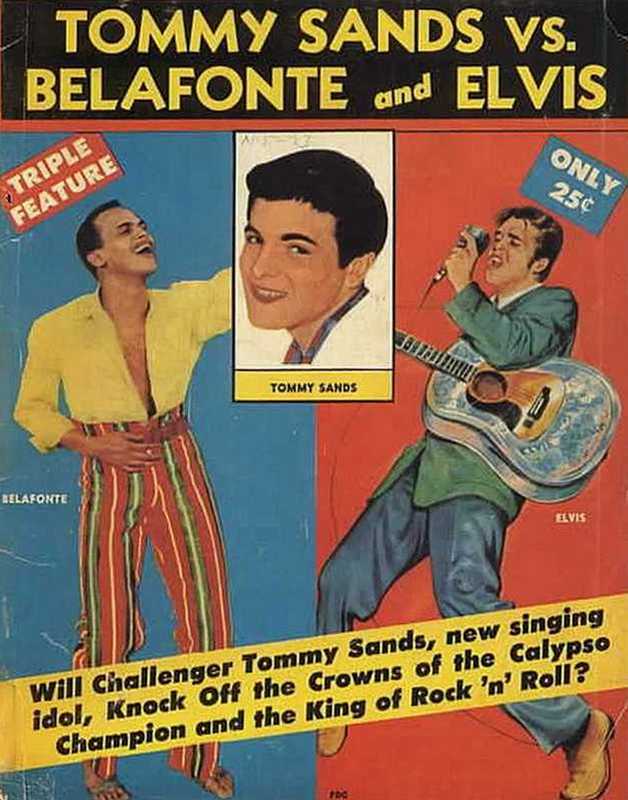 TOMMY SANDS vs. BELAFONTE and ELVIS is the 2nd one shot title that is near impossible to find in auction these days. As if one battle that never really was wasn’t enough, one-hit-wonder Tommy Sands got thrown into the ring as well. According to the publishers, Tommy was ready to take on (not just one but) both leading artists in their respective genres. What??? 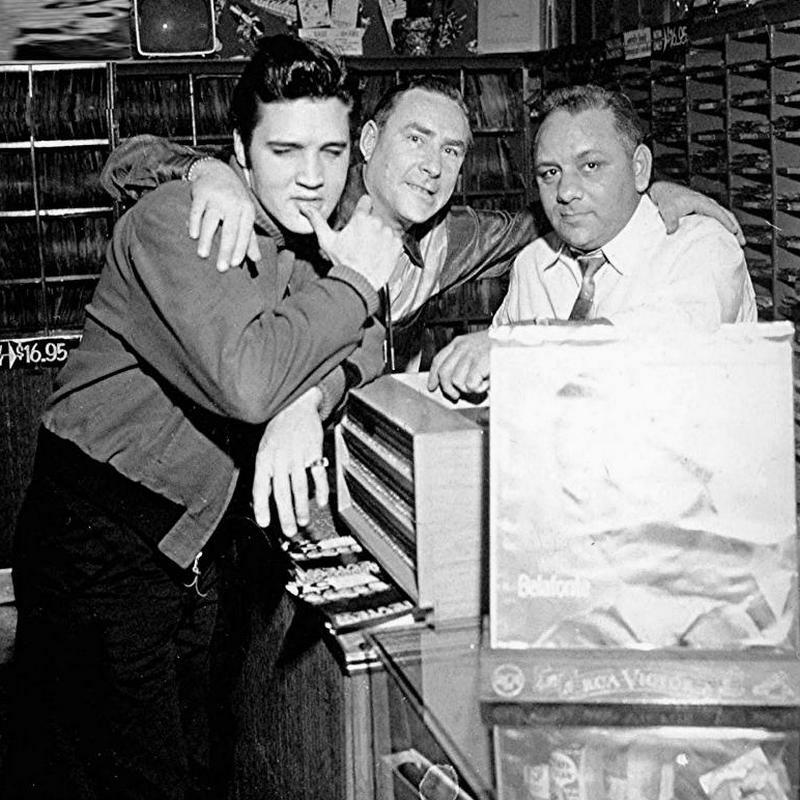 Here we have some very interesting photos of Elvis visiting POPLAR TUNES in Memphis, in early 1957. By looking at these pictures one can tell how popular Harry Belafonte actually was: his face/records appear in nearly all of the photos taken that day at Poplar, even though of course Elvis was Memphis’ local hero. Elvis seems to be looking at one (of three) of Belafonte’s albums on the top shelf. Elvis’ own two LP’s can be seen to the right of the photo. Apart from the cool Elvis director’s chair we can spot a huge stock of Belafonte 45’s that are brought to the attention by the BELAFONTE 89¢ record-divider. 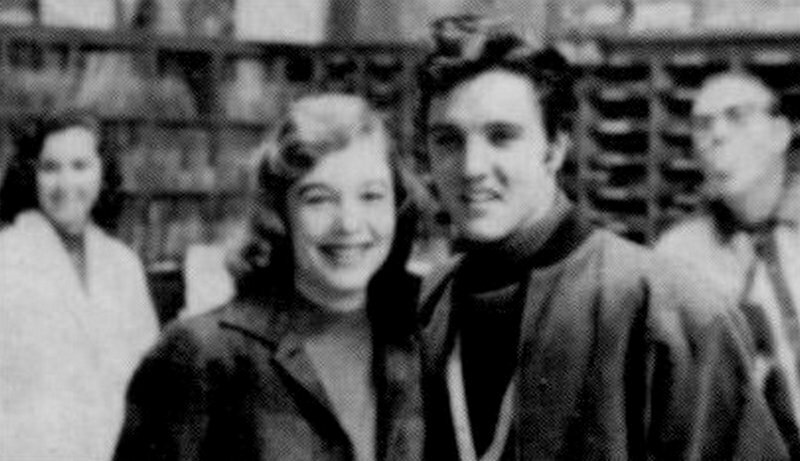 There is no Belafonte in this lucky fan’s photo, but to the right we can spot Memphis DJ Dewey Phillips while we see Elvis’ girlfriend Barbara Hearn to the left. 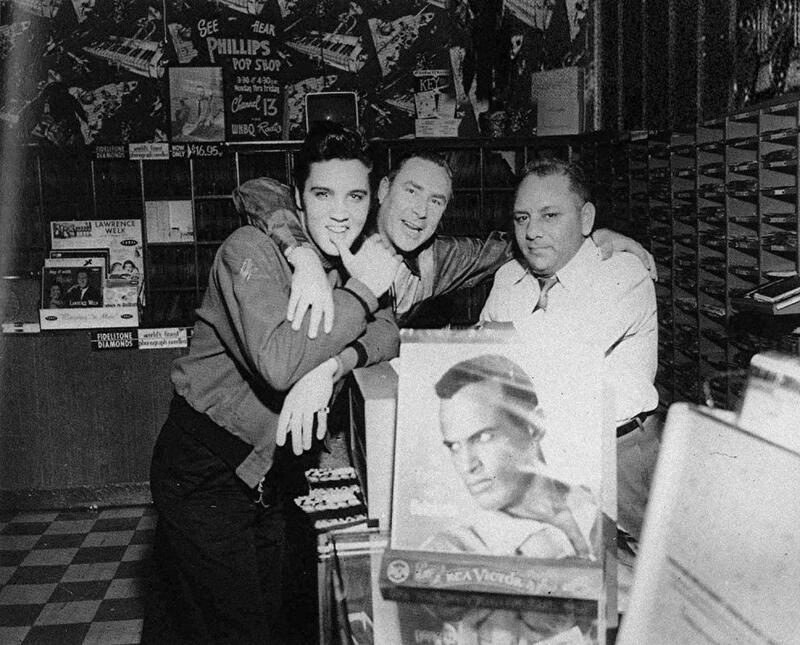 In these two images Elvis is in the company of Dewey Phillips and record shop owner Joe Cuoghi. In front of these gentlemen we see an RCA promo display for An Evening With Belafonte. The photo to the right is quite wellknown (though it is usually heavily cropped with the Belafonte display being photoshopped out of the image). But the photo to the left has very rarely been seen. 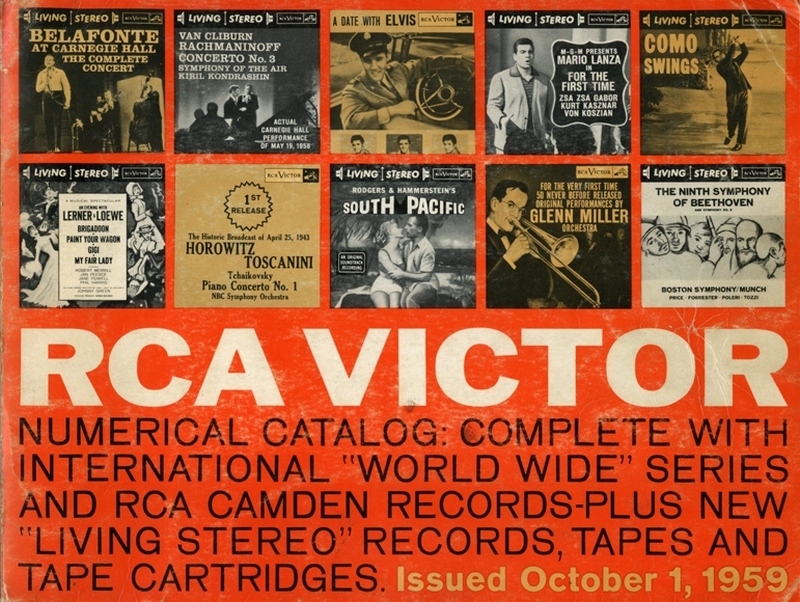 Five RCA recording stars have been collected on this album, with two songs by each artist. This time we have 12 RCA recording stars singing one song each on this album. In JAILHOUSE ROCK (1957), many RCA recording stars pop up on the posters on the wall of the studio while Vince is going through Treat Me Nice and Don’t Leave Me Now. Next to Pery Como, Eddie Fisher, Lena Horne and Dinah Shore we (of course!) see Harry Belafonte’s face on one of the most prominent spots on the wall. During the close-up shots of Treat Me Nice (taken with a different set-up) a 2nd image of Belafonte (actually the cover of An Evening With Belafonte) can be seen on the wall behind Elvis. 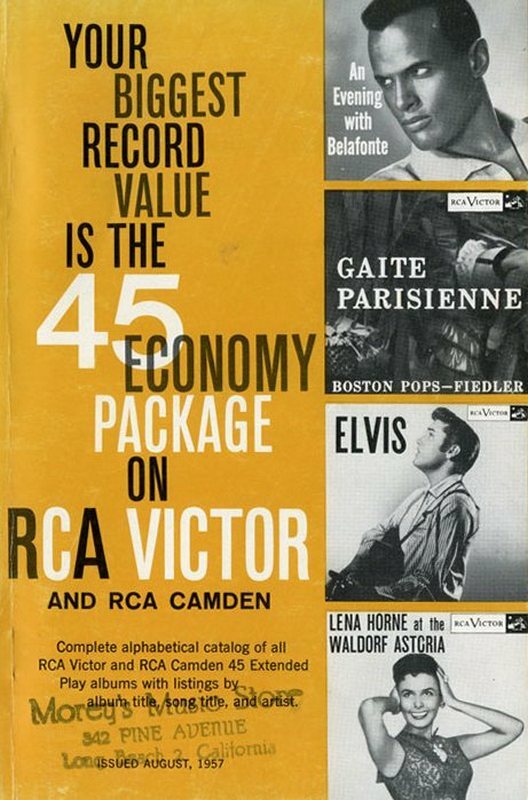 Here we have three RCA VICTOR CATALOGS that all carry an album by Elvis as well as Belafonte on the cover. The catalog below to the left is from January 1957. The one next to that is from August 1957. And the catalog to the right is from October 1959. Okay. So who was ‘King Of The Charts’? Was it Elvis, or Harry? Let’s take a look at the statistics, as supplied by BILLBOARD Magazine! 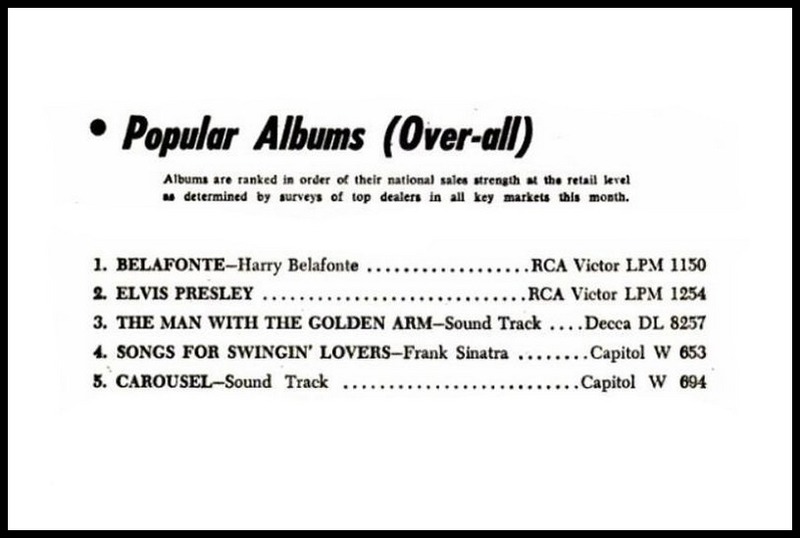 BELAFONTE (Harry’s second LP) went to Nr. 1 on March 24. It remained Nr. 1 for six weeks. 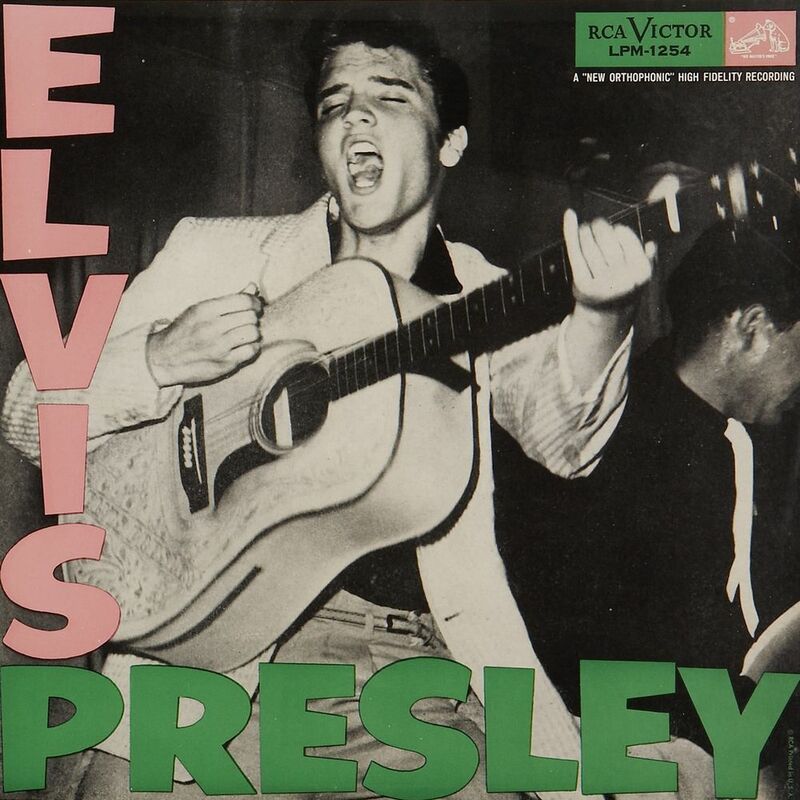 ELVIS PRESLEY (Elvis’ first LP) had moved to the Nr. 2 position by April 28. ELVIS PRESLEY remained Nr. 1 for ten weeks. 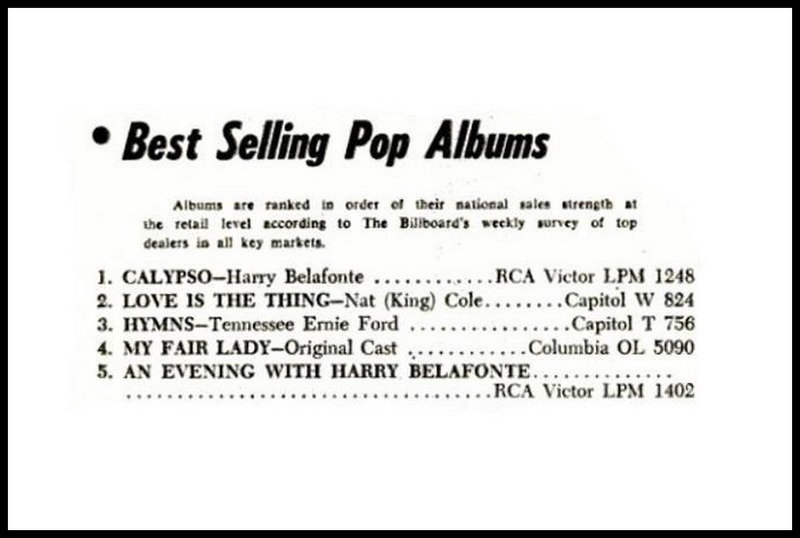 CALYPSO (Harry’s third LP) went to Nr. 1 on September 8. The album remained in the Nr. 1 spot for four weeks. 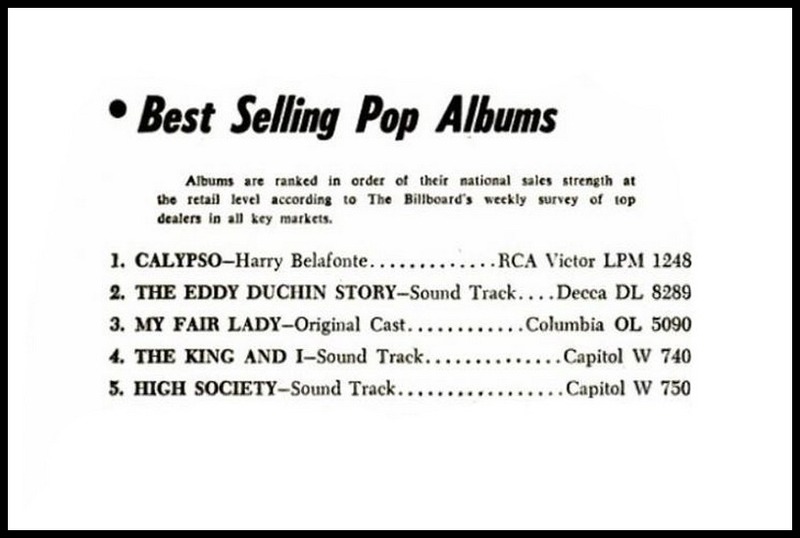 After losing the topspot for a total of two weeks (to the soundtracks of The King And I and The Eddy Duchin Story), CALYPSO regained the Nr. 1 position for another seven weeks on october 20. 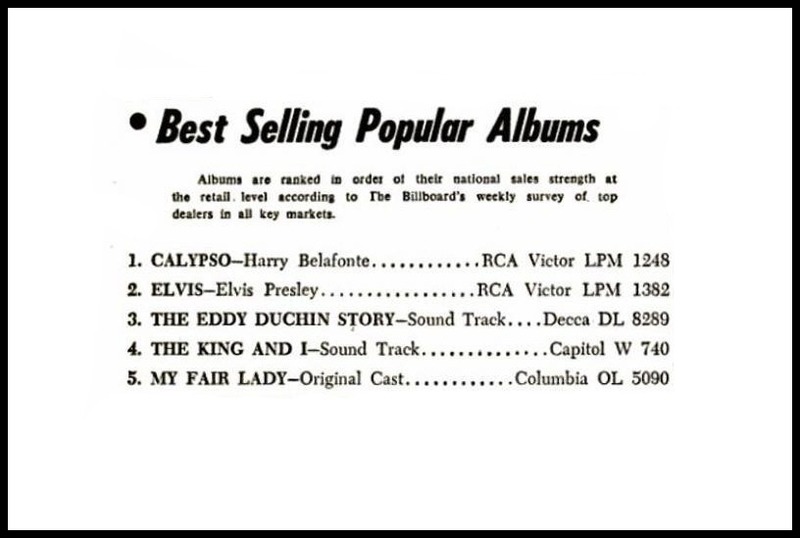 By December, CALYPSO had become the biggest selling album of the year, and it was also the first ever LP in history to sell over one million copies. 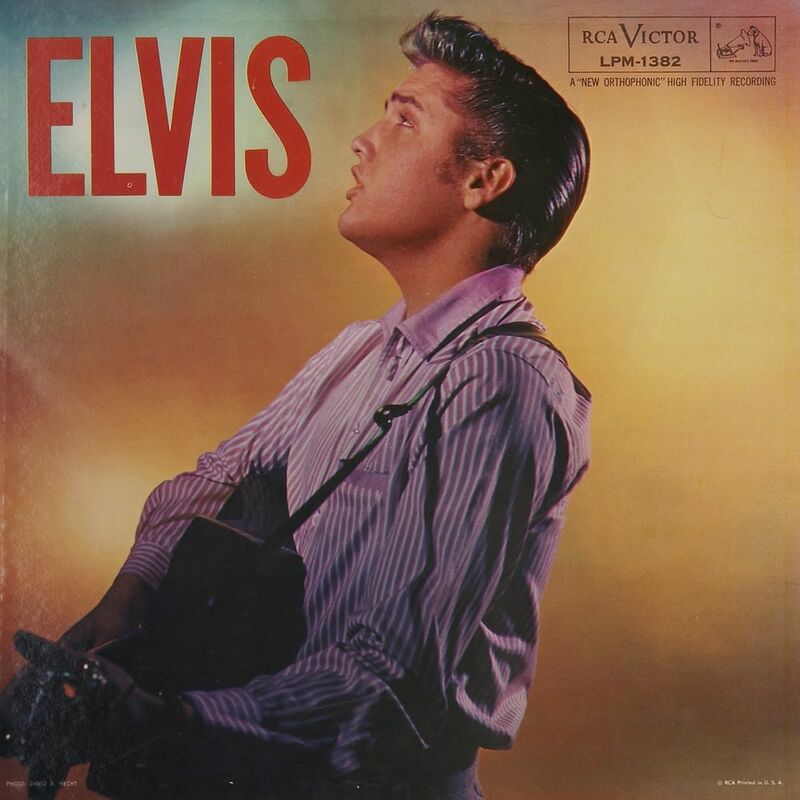 ELVIS (Elvis’ second LP) had moved to the Nr. 2 position on December 1. One week later ELVIS will take over the Nr. 1 spot from CALYPSO (see next entry). ELVIS remained Nr. 1 for five weeks. So, twice in a row Elvis Presley was responsible for taking over the Nr. 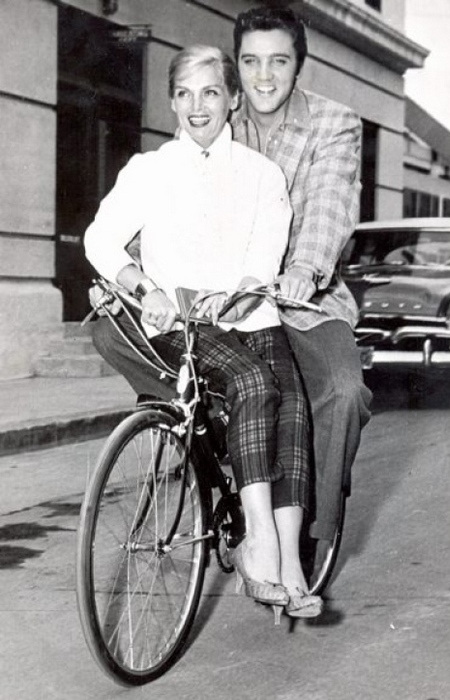 1 position from Harry Belafonte. 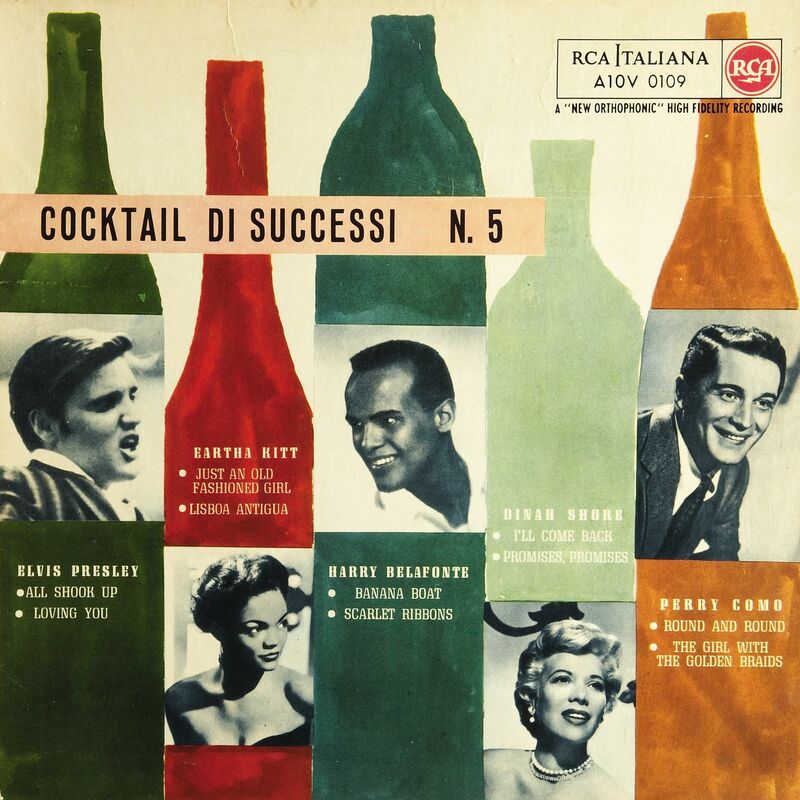 But it turned out that the success of CALYPSO was far from over, in fact, it had only just begun! On January 12 CALYPSO moved ELVIS back to the Nr. 2 position, regaining the top spot for a third time, and this time the album remained in the Nr. 1 position for another 20 weeks. 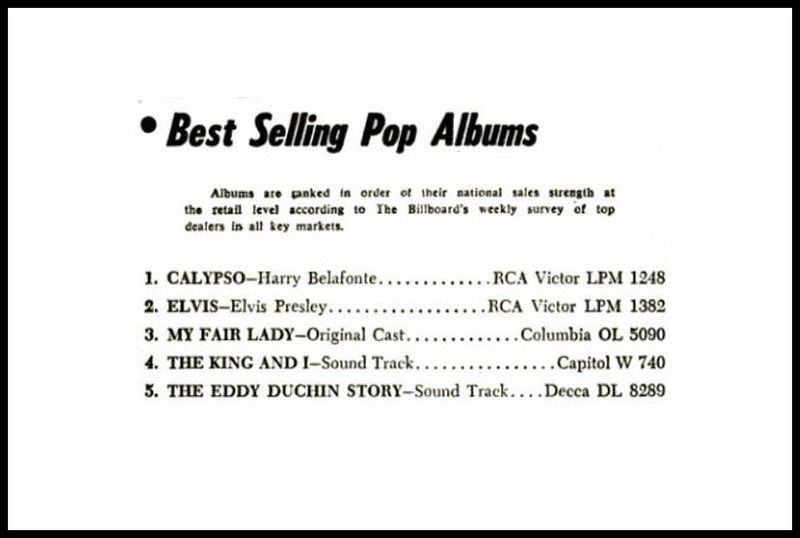 CALYPSO stayed on top of the Billboard Album chart until May 20. The LP had been the Nr. 1 album in the USA for an incredible total of 31 weeks. 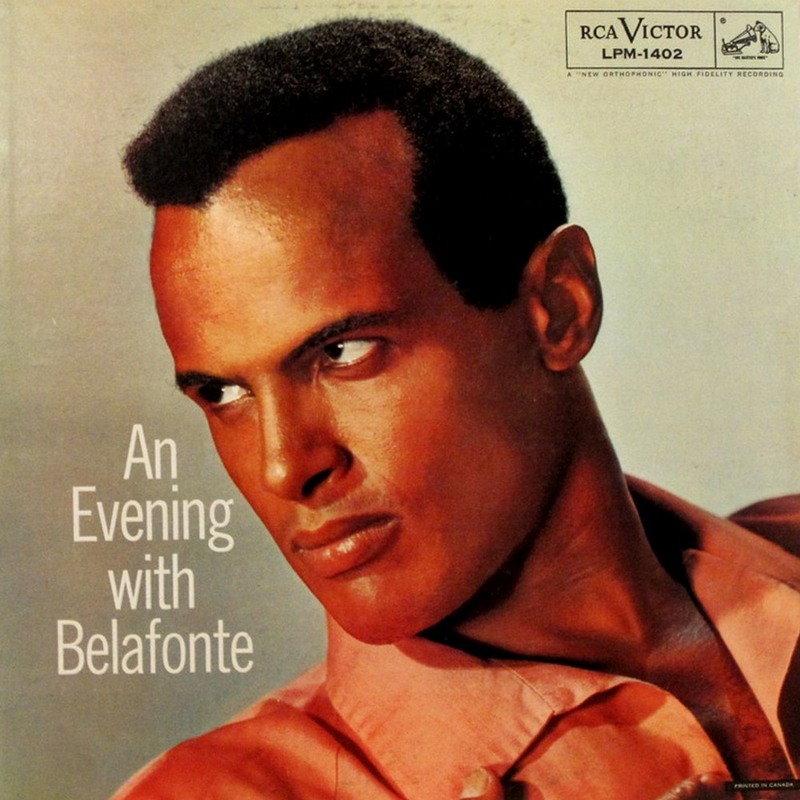 In the same week, AN EVENING WITH BELAFONTE (Harry’s fourth LP), released while Calypso was still in the Nr. 1 position, dropped two places from 3 to 5. 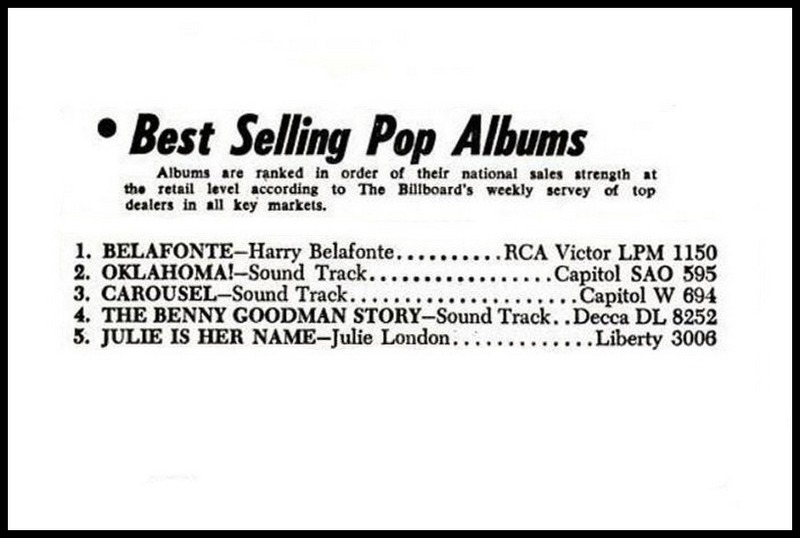 Harry Belafonte had enjoyed a tremendous run on the charts with his two consecutive Nr. 1 hit albums, but he would not score a Nr. 1 album again during the course of his career. And this is really where ‘the battle’ for the Top Spot between Rock ‘n’ Roll (Presley) and Calypso (Belafonte) ended. Who was the King Of The Charts? Before we come to a conclusion, let’s take the album releases of 1957 into account that did not battle it out on the charts, but that have played a significant role nonetheless during the Calypso and Rock ‘n’ Roll crazes when it comes to album sales and chart listings. This LP would not be able to equal the succes of its two predecessors, even though it eventually reached the Nr. 2 position. Harry’s fifth album went to Nr. 3 on the Billboard chart. Elvis’ third album would also become his third Nr. 1. 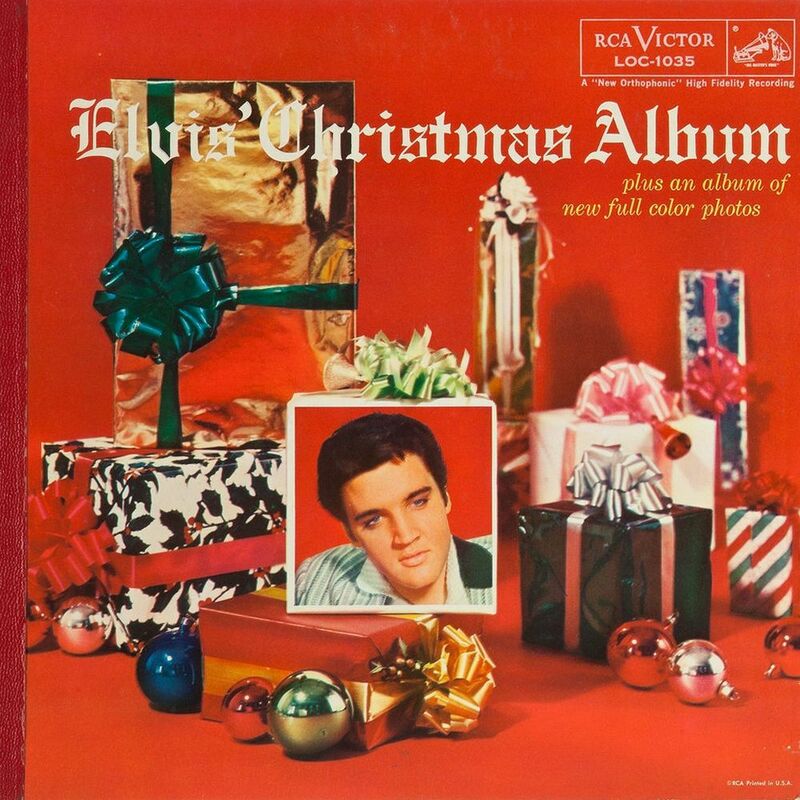 Album number four was Elvis’ fourth consecutive Nr. 1. 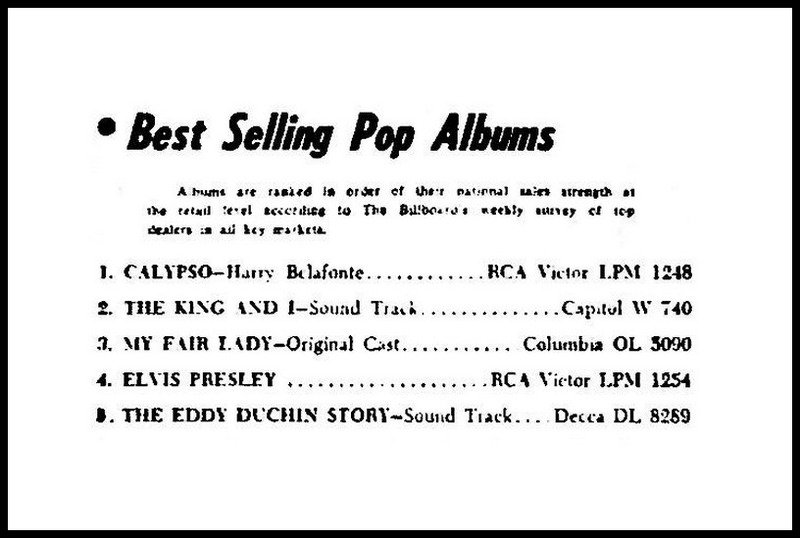 During 1956 and 1957, Elvis and Harry both released 4 albums. Two of Harry’s albums went to Nr. 1, spending a total of 37 WEEKS (6 + 31) in the top spot. 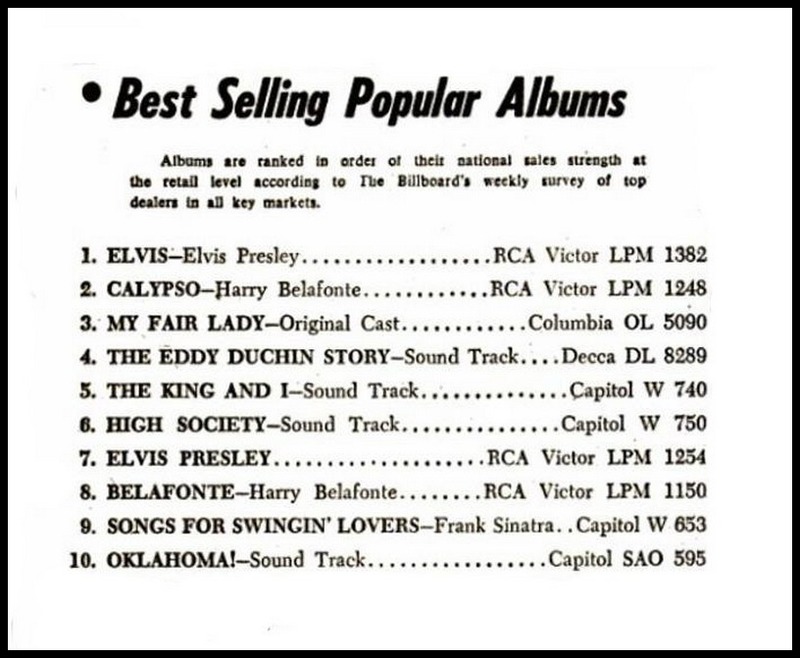 All four of Elvis’ albums reached the top of the chart but they ‘only’ totaled 27 WEEKS (5 + 10 + 10 + 2) in the Nr. 1 spot. Next to his Nr. 1 albums, Elvis had also enjoyed many Nr. 1 singles in 1956 and 1957, while Harry had never made it to Nr. 1 with any of the 7″ formats. That said, Harry’s audience (mature America) was not the single buying public, while Elvis’ target audience (teenage USA) consisted mainly of single buying teens. On the other hand, Harry spent a recordbreaking total of 99 weeks on the Album chart with CALYPSO. Elvis would not be able to break this record until 5 years later when G.I. Blues left the chart after 111 weeks. For having spent 64 weeks (out of 104) in the Nr. 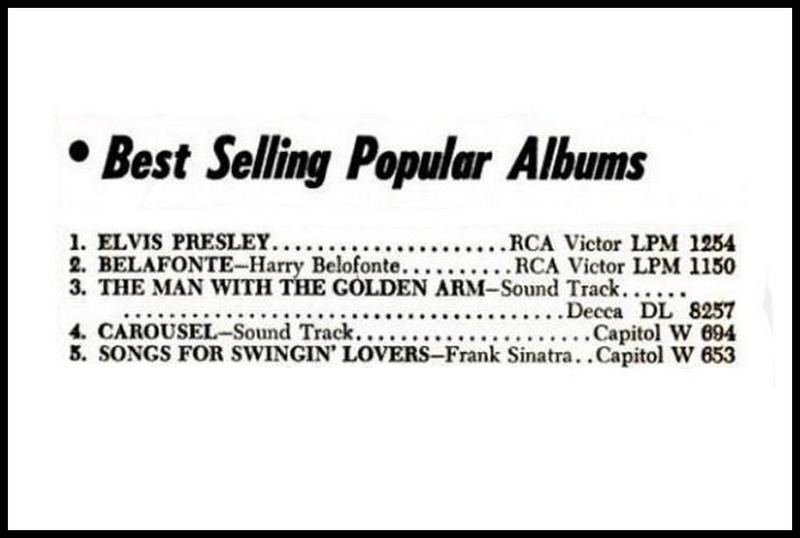 1 position with the 2 biggest sellers in the music business in 1956 and 1957! Of course there never was a ‘battle’ in the first place. Rock ‘n’ Roll and Calypso co-existed peacefully together since both genres targetted very different audiences. Love the Italian 10″ lp’s. They sure were plugging Belafonte in Poplar Tunes! Hi Jim, thanks for commenting. Cocktail # 8 wasn’t a 10 inch but a regular big one. lined up for future topics on Echoes… We keep on digging! My mistake number 3 and 5 were 10″. Look forward to some nice rare records from around the globe. Friend-The Boy Friend Corp 1957 66pgs in Fine almost Mint condition. Does anyone know the current grade values? it all has gone down a bit. the rare! Great collectors piece, PJM ! Do you also have the “16” issue in your collection? Sorry for the major delay. I am looking to sell the mag asap. 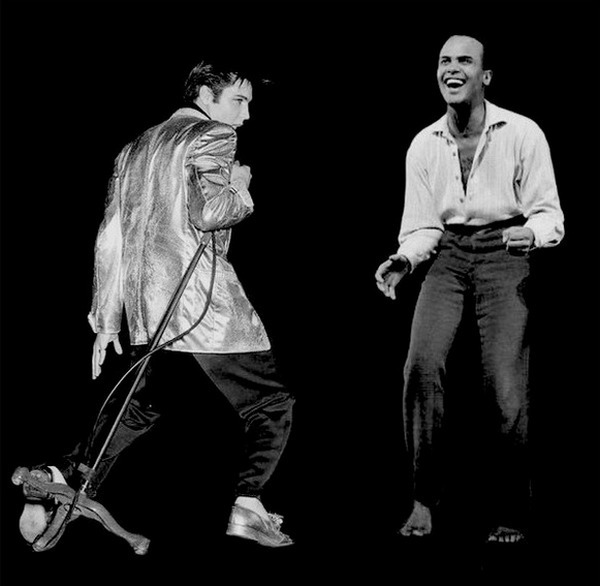 What would you offer for the Tommy Sands vs. Belafonte and Elvis? 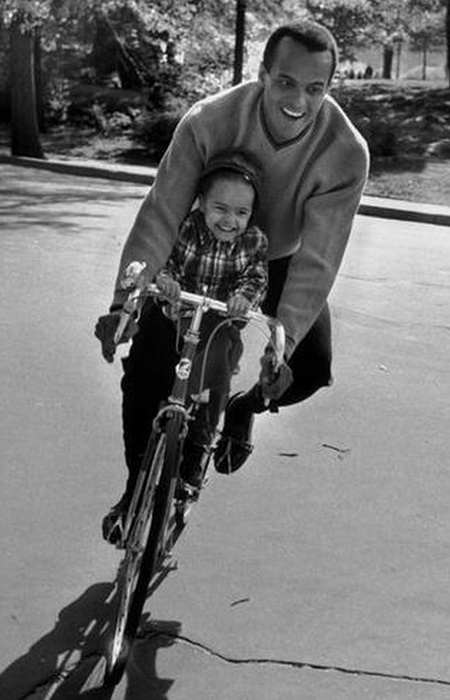 Harry Belafonte is more than a match for Elvis. Harry was and is one of the very best voices of them all. The great Marty Robbins and the greatest voice of them all, Sam Cooke, also did a grand job. What a load of crap! He was no match for Elvis. 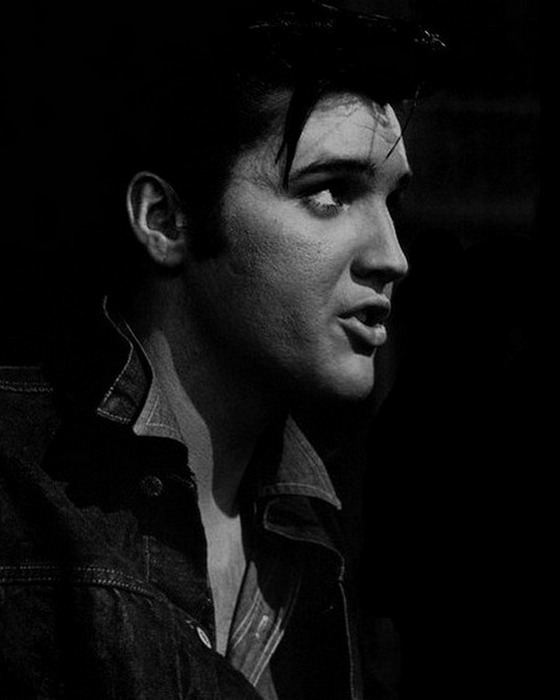 Elvis changed popular music and culture. 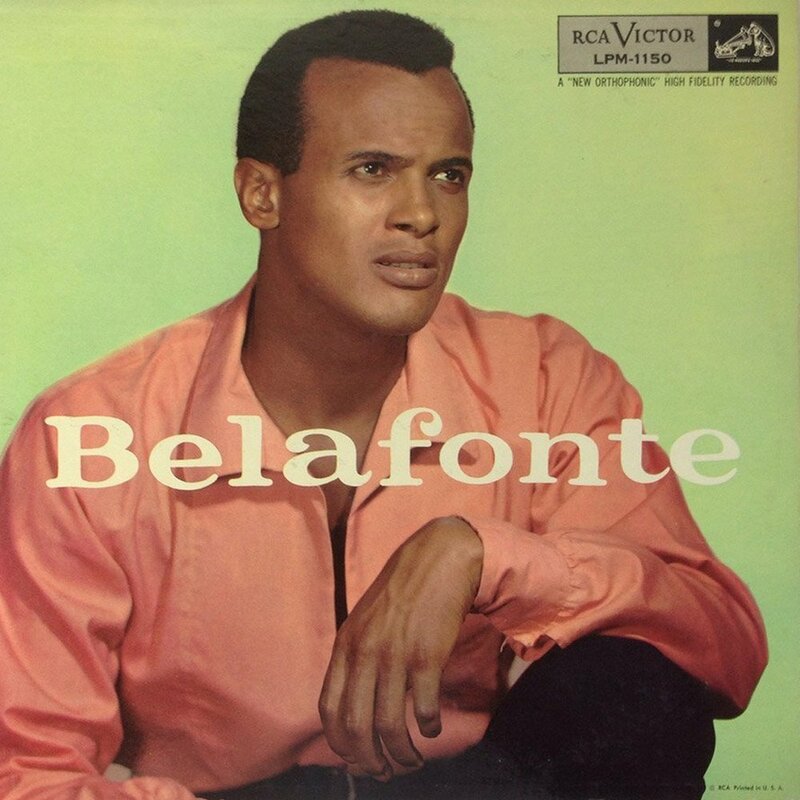 All Belafonte did was take an existing musical genre and have some success with it. You obviously haven’t listened to much of Elvis’ extensive repertoire beyond a few of the popular hits. He covered many genres, and is still having No.1 albums to this day. Leaving Elvis aside for a moment (his talent, success, popularity and influence is something that is self evident so doesn’t need defending) you argue that Same Cooke has the greatest voice of all. What? Greater than Caruso, Lanza, Pavarotti? Comparing voices in such a manner is pointless. If you’re going to go down that route then you could argue that Jackie Wilson had a far better voice than Cooke – it certainly had a far greater power and range. Again, it’s a pointless exercise. Many people have great singing voices, Elvis included, yet it takes more than that to change popular music and culture forever. Elvis did that, Belefonte didn’t. Thank you for such an informative website! I have searched the web over for information on this rare tommy sands vs Belafonte and Elvis magazine you guys are talking about. I also have one in mint condition and was going to sell it but didn’t know what price to put on it. I see one on ebay now listed for $350.00 so I thought I better do my homework. Please email me if you guys find out any new info or if any of your collectors which to pay a good price for it. Thanks! Have a blessed day! Let’s have a whole section on Daddio Dewey, Quiffy! Thanks, Ger, for sharing these rare images. When I started out in this racket, er, business, I had this friend of mine, whom I haven’t seen for ages, who was also an Elvis fan, and whose father had worked in West Germany in the early 60s, and was a huge Belafonte fan. While in Germany, he had access to original US RCA Victor issues of Harry’s records and they were still in his collection by the time his son and I became interested in rock and roll. He used to play his Belafonte collection for us, and I still remember the likes of “Jamaica Farewell”, “Day-O” and “Star-O”. 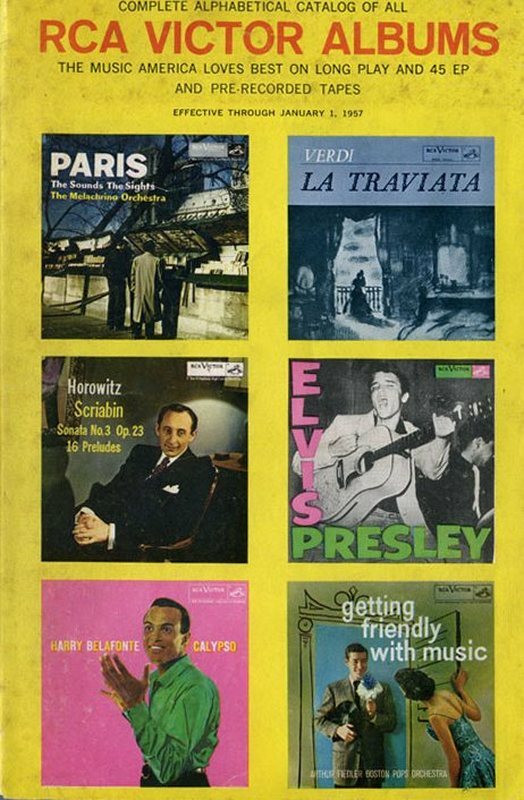 Unfortunately, he hadn’t kept the US Presley issues he had purchased around the same time, so we had to make do with the inner sleeves of Harry’s albums, which featured beautiful colour reproductions of other Victor releases, including some by Elvis. A brief glimpse at Elvis Presley fandom long before the days of FTD. For free ! And thanks for the new added info + pix. Very much appreciated! Great feature, and the punch-line was superb, thank you. Unusual feature, Harry Belafonte’s Jump In The Line is currently used on a TV AD for mobile phones, and was also used in the weird film BeetleJuice. Apparently missed this first time round, so thanks for the update. Very interesting read! I was brought up on listening to both. Great article. I like this article. It is balanced, well written, based on facts, and both singers are treated very respectfully. I wonder what would have happened if RCA would have spread the albums better in time. But wait, oh no … by 1958 and 1959 there would be more competition from the Jim Reeves-albums (also on RCA)! Just love reading articles like this. Very well documented. Wait and see the next comparison. So today on a hot day in Holland in 2016, I heard this song blaring from a car radio and was immediately reminded of this topic. Such a great song. Some songs are best heard on a car radio! 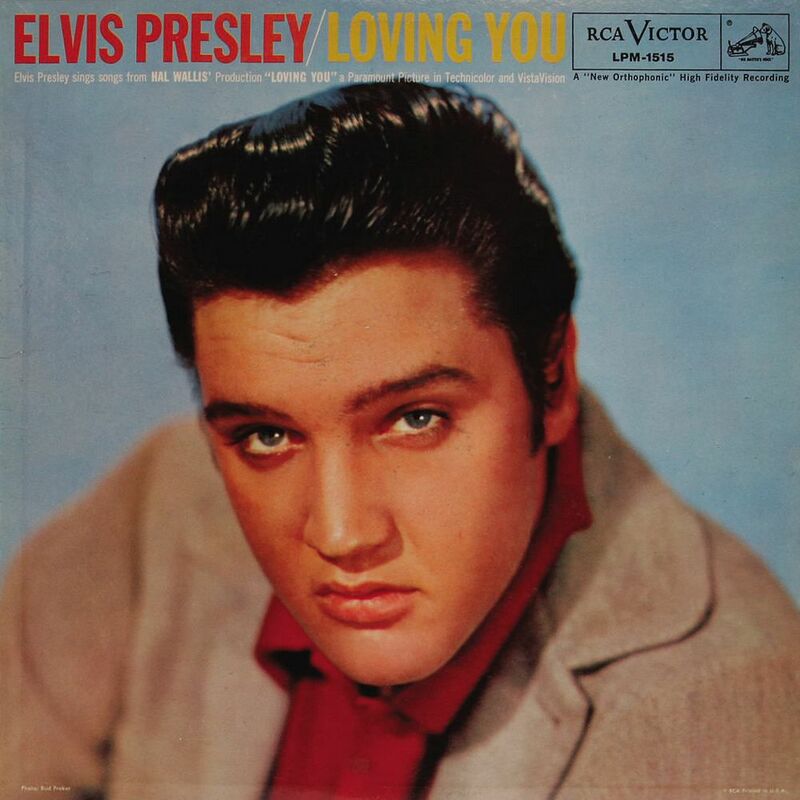 The charts is one thing, but the output of RCA during those two years favoured Presley, who sold 10 million units in 1956 and another 14 million units in 1957. Also, by mid 1957, when the economic data from 1956 was released, it showed that the sale of RCA radios, transistors, recorders, phonographs and televisons had doubled, tripled and quadrupled, with respect of those sold in 1955, the latter being partially the result of the extraordinary tallies Elvis garnered for at least two of the three networks, yielding in excess of 200 million cumulative viewers for his 12 appearances from late January of 1956 to early January of 1957, three of them hitting a 40 rating or over, with an additional record, still unbeaten, to this day, naemly the 82.6 % share obtained on 9 September 1956, the night of his first appearance at the Ed Sullivan Show. Presley also toured 107 ciities, playing in 289 shows during that period, drawing over a half a million fans to large auditoriums and at least seven stadiums, both in the US and Canada. 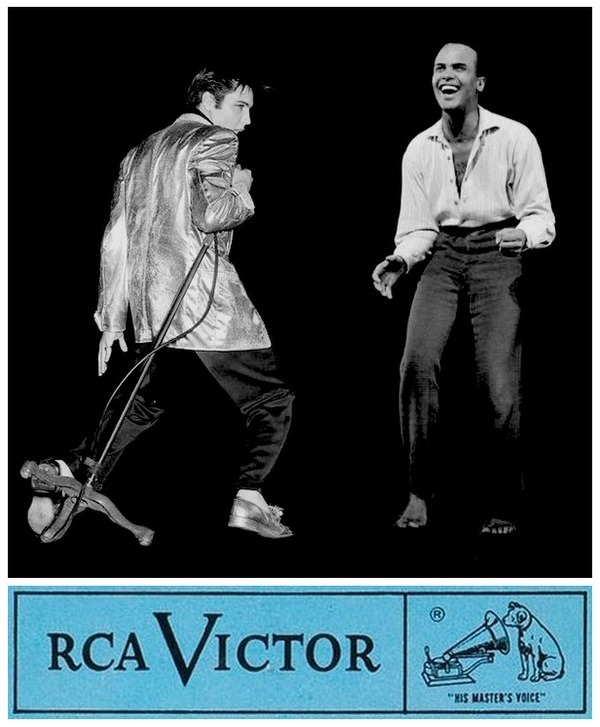 For all of the above, which is in addition to chart results, RCA owed a lor more to Presley than it did to Harry, in that two year period and obviously, beyond as well. Is anyone here? 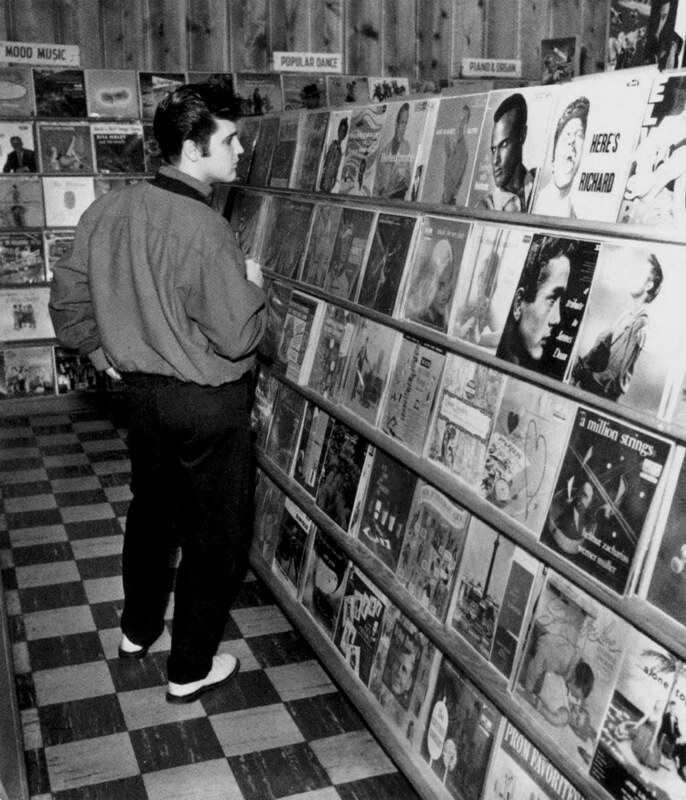 I cant seem to figure out that photo of Elvis in the record shop. There is an album below the ones he’s looking at, a blonde woman looking over her shoulder, what is THAT record? Thank you for visiting the Echoes website. The album you’re referring to is “Music For My Lady” by Frank Perkins (Decca 8395) released in 1956. Bob, thank you, how did you know that sir? Wanna send me a copy? There’s nothing online, you must be 100 years old or an old hippie … tell me what went wrong.